Data from the popular encrypted messenger app Telegram was hijacked by Iran’s state-owned telecommunications giant on Monday, a day before proposed protests over the country’s economic crisis. The move looks to be a BGP hijack, a practice where an intermediary illegitimately takes over groups of IP addresses so data originally destined for one place can be forcefully sent to another. Monday’s attacks were widely detected as they happened by Oracle’s InternetIntelligence and Cisco’s BGPMon. BGP, or the Border Gateway Protocol, is the technology that exchanges routing data across the various networks that make up the entire global internet. “Once a valid BGP hijack occurs, the hijacker can perform [man-in-the-middle] attacks, eavesdropping, etc.,” said Nico Waisman, a cybersecurity researcher at Cyxtera. Iran’s minister of Information and Communications Technology confirmed the reports in a Tweet on Monday night, saying that “in the event of an error, whether inadvertent or intentional, the Telecommunication Company of Iran will be severely penalized.” An investigation is underway. Hijacking BGP is a common tactic used by both cybercriminals and nation-states for financial gain, surveillance and censorship. It’s happened everywhere from Italy to Russia to the United States. The tactic has become more difficult in recent years as observers are watching more closely — exactly the kind of intense attention focused on Monday’s incident. Despite being officially banned in Iran, over 30 million Iranians continue to use Telegram using the applications Hotgram and Talagram, Iran’s Deputy Prosecutor General Abdolsamad Khorramabadi said last month. Telegram did not respond to a request for comment. A screenshot of a call to protest in Iran being passed around on Telegram. 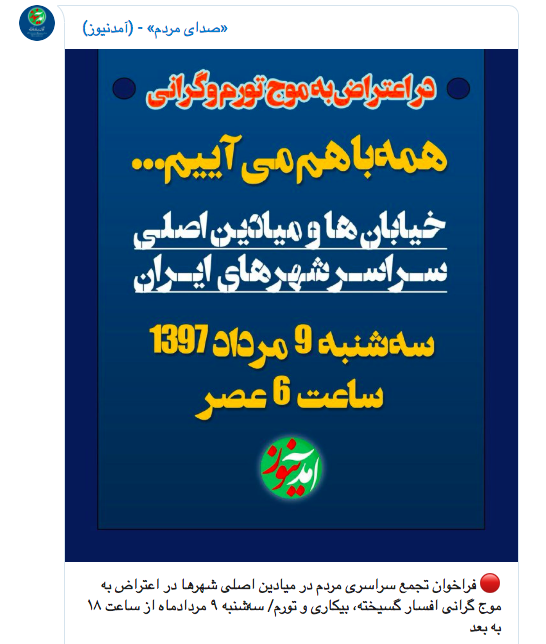 The protests have been promoted by Amadnews, an Iranian protest platform watched by millions of Iranians. It’s organized in part by Iranian opposition members living in exile since the 2009 election protests, which were organized largely on Twitter.